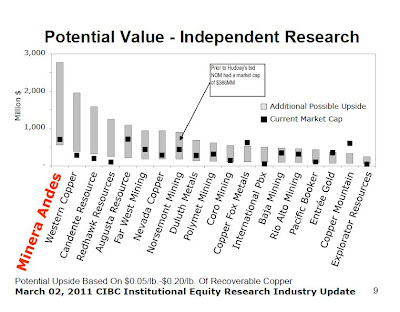 Minera Andes CEO Rob McEwen says the company's Los Azules property lies among the world's copper giants. A preliminary assessment suggests it also may be a candidate. "TNR has also subsequently claimed that Xstrata (and Minera Andes) did not complete the required exploration expenditures pursuant to exercise the option to acquire the properties underlying the Solitario Agreement. TNR, by consequence, claims properties underlying the Solitario Agreement should be returned to TNR." 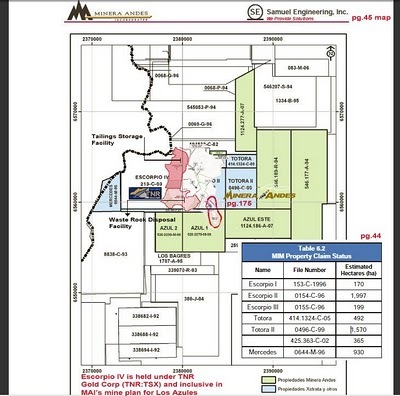 "Properties underlying Solitario Agreement" are called "Xstrata" on the map below. On April 1, 2010, the Company (and certain subsidiaries) filed a Statement of Claim in the Supreme Court of British Columbia against TNR Gold Corp and its subsidiary, Solitario Argentina S.A. (together “TNR”). 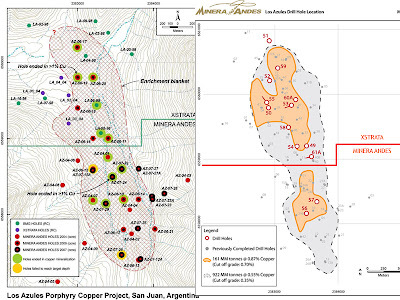 This claim was subsequently consolidated with a related matter between TNR and MIM Argentina Exploraciones S.A. (Xstrata Copper) commenced by TNR against Xstrata in the Supreme Court of British Columbia in 2008. These claims, in part, pertain to a purported 25% back-in right (or in the alternative, damages) by TNR to certain properties comprising the Company’s Los Azules copper project. 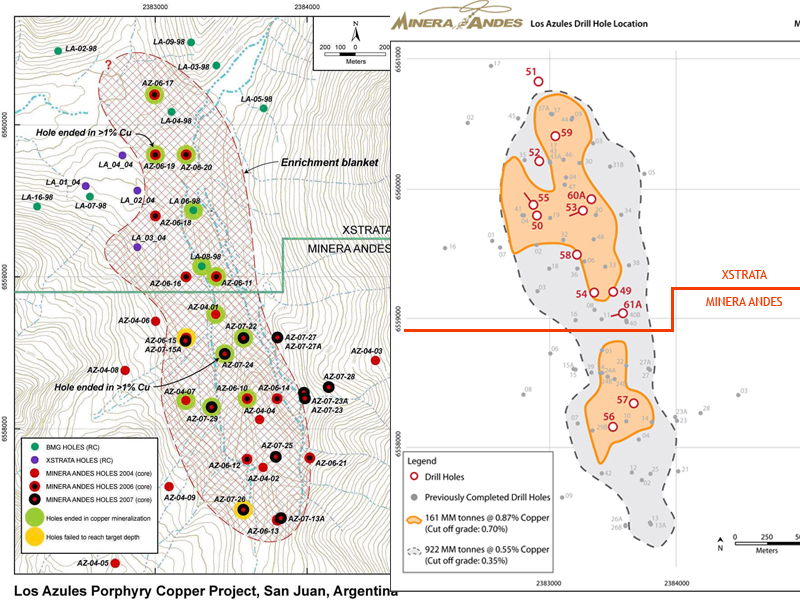 Certain of the properties formerly held by Xstrata and transferred to the Company pursuant to the (Los Azules) Option Agreement remain subject to an underlying option agreement between Xstrata and Solitario Argentina S.A. (“Solitario”), whereby Solitario had the right to back-in up to 25% of the properties covered by the underlying option agreement (the “Solitario Agreement”), exercisable by Solitario upon the satisfaction of certain conditions within 36 months of Xstrata exercising the option, including the production of a feasibility study. Xstrata exercised the option pursuant to the Solitario Agreement effective April 23, 2007. The 36-month period expired on April 23, 2010, without a feasibility study having been completed. 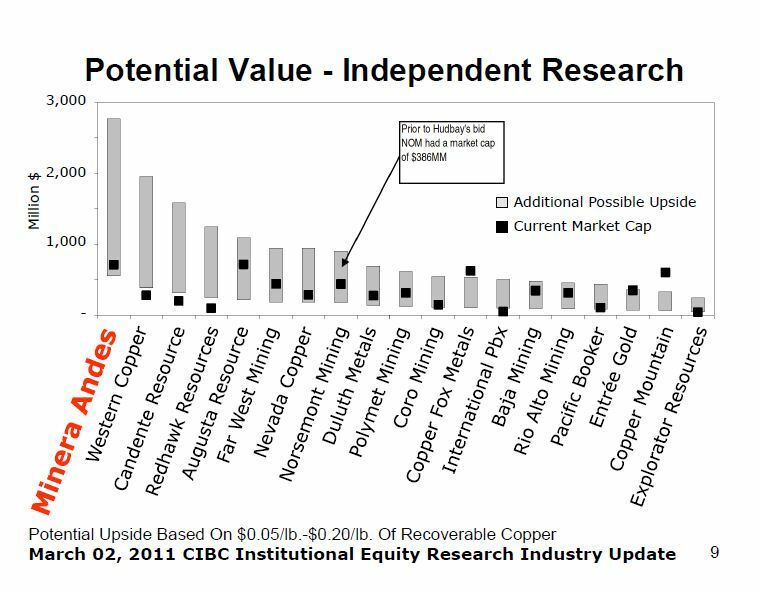 TNR has also subsequently claimed that Xstrata (and Minera Andes) did not complete the required exploration expenditures pursuant to exercise the option to acquire the properties underlying the Solitario Agreement. TNR, by consequence, claims properties underlying the Solitario Agreement should be returned to TNR. The Company rejects the alleged right of TNR to back-in to any portion of the Los Azules Copper Project and its assertion that the Solitario Agreement option was not validly exercised. At this time, the Company is not able to estimate the potential financial impact of this claim. However, if resolved adversely to the Company, this litigation could materially adversely affect the value of the Company’s interest in the Los Azules Project and its ability to develop the Los Azules Project." These motions concern applications brought by the defendants Minera Andes Inc. and related companies pursuant to Rule 6-1(1)(b)(i) of the Supreme Court Civil Rules (the “Rules”) for leave to amend their Response to Civil Claim, Counterclaim and Third Party Notice and for an order pursuant to Rule 22-5 that Supreme Court action, Vancouver Registry No. S-103104 (the “Solicitors’ Action”), be tried at the same time as this action. The third parties (“TNR’s Lawyers”) seek an order striking out the Third Party Notice on the ground it discloses no reasonable cause of action. The plaintiffs support this application. Accordingly the defendants’ applications to amend its Third Party Notice and to join this action with Supreme Court Action No. S103104 are dismissed. The defendants’ application to amend its Response to Civil Claim and to amend its Counterclaim is allowed. TNR’s Lawyers’ application to strike the Third Party Notice is allowed. TNR’s Lawyers and the plaintiffs will recover costs for these applications." Minera Andes to spin out Los Azules. Background on Los Azules litigation, TNR Gold, Minera Andes and Xstrata. 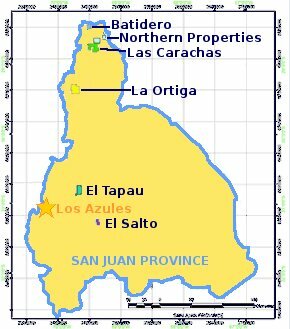 TNR Gold Corp. ("TNR") is pleased to announce that Xstrata PLC ("Xstrata") has exercised its option to acquire a 100% interest in the Los Azules Property. The way we read the warning from Minera Andes is that recently (this warning has appeared for the first time in recent filing) TNR Gold has claimed that the required exploration expenditures were not complete according to the agreement. It can be explained if TNR Gold lawyers had the access to the internal documents of Xstrata and Minera Andes during the discovery stage in this litigation and found something to support this claim.